We all know "there's an app for that." Usually we're referring to apps that make our lives a little bit easier somehow. But what if there were a bunch of apps out there that'll actually pay you to shop? 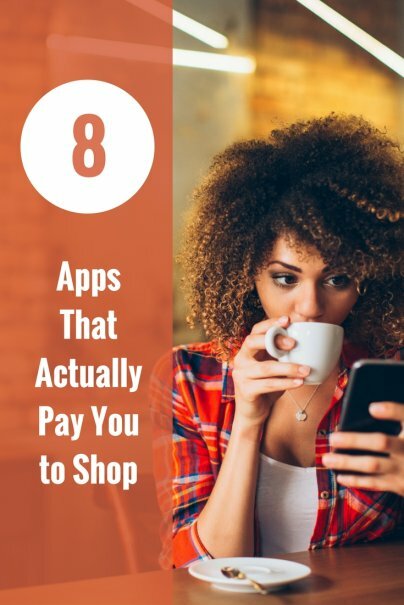 Whether it be through earning cash back by purchasing stuff we'd be buying anyways, or simply paying you to snap a pic of your receipt, these apps all have the potential to help you earn some significant money. What's more helpful than that? Swagbucks is a cash back app with a twist — namely it focuses on surveys as its primary business model. You download the app, pick a survey to complete, and earn "Swagbucks" when you complete it. The cool thing about the surveys is they tell you exactly how long they will take to complete, and the number of Swagbucks you'll earn. For example, a six-minute survey will give you 50 Swagbucks and the questions are very simple, opinion-based questions. Earn 500 Swagbucks and you'll be eligible for a $5 gift card from Amazon, Starbucks, Walmart or Target. Sitting in the doctor's office waiting room, or maybe at the DMV, complete a Swagbucks survey or two, and before you know it, you'll be treating yourself to a free Venti Frappuccino. While already on the radar screen of most frugal shoppers, iBotta is a terrific way to earn cash at the grocery store. Cash back takes the form of "rebates," and you simply unlock rebates on specific items before you head to the grocery store. Items that often have rebates available include such staples as milk, eggs, yogurt, and butter. Then when you return home, just scan the receipt with the iBotta app and your rebates, once verified, go straight to your account balance. When your iBotta account reaches $10, you can request payment via PayPal or Venmo. The app is terrific way to supplement traditional paper coupons and double your savings in many cases. The ShopKick app rewards you with free gift cards for doing the shopping you'd be doing anyways. It works by giving you reward points, known as "kicks," just for walking into stores like Walmart, Target, Starbucks, Best Buy, and even at your local grocery store. Then when you buy something from the store, you earn even more kicks. Earn enough kicks, and you'll get rewarded with free gift cards to the store of your choosing. Surprisingly, it doesn't take much to earn things like a $5 Starbucks gift card. You'll also be kept updated with new coupons and deals at your favorite stores so you can save even more. An insider tip to quickly add up kicks is to follow ShopKick on Facebook as they update their feed with new ways to earn free kicks. Mobee touts themselves as a "fun, new way to make money on your phone." Once downloaded to your smartphone, the app works by displaying "missions" in your local area that pay you money to complete. The missions are displayed on a map allowing you to quickly see which ones you can easily perform on your next shopping trip. The idea is that you're going to be there anyways, so why not earn a couple bucks in the process? For example, your local Starbucks might have a mission that requires you to answer a few questions about your visit. Most missions give you 250–750 points and a $5 Starbucks gift card is available after about 500 points. Earn 2,500 points at Walmart and trade your points in for a $25 gift card. I was happily surprised to see the points required to earn gift cards were very reasonable, making this app worth a look. Receipt Hog allows you to cash-in on your shopping receipts. Unlike cash back apps like iBotta, Receipt Hog lets you earn rewards by scanning your receipt from ANY store and it doesn't matter what items you purchased. Once you earn 1,000 points, you'll be eligible for a $5 Amazon gift card or $5 sent directly to your PayPal account. You'll earn 50–100 points per receipt making a free $5 pretty easy to obtain. I've been using this app for a few months and have already earned $25 in Amazon gift cards with very little effort. When you're out-and-about, on a shopping trip, or simply taking a stroll through town, use the Gigwalk app to earn some extra cash by completing small tasks. A couple "gig" examples include $10 for taking a dog on a walk or $4 for taking a picture of a store display. The closer you live to a large metropolitan area, the more gigs will be available to you. While the app is appealing as a cool way to earn a few extra bucks, the negative reviews of the app revolve around not enough gigs available and a waiting period for approval that often exceeds a week. But it definitely has potential and is worth being on your radar screen. Somewhat similar to Gigwalk, Field Agent pays you to do small jobs in your local area. The biggest difference between the two apps is that Field Agent is more shopping-focused and has "jobs" at locations like Costco, RiteAid, Safeway, and Marshalls. Jobs are first come first serve, pay between $2 and $15, and must be accomplished within two hours of accepting. An example of a past Costco job was an "egg audit," which for $7, required you record the egg sizes, egg prices, and count the number of egg products in the warehouse. An easy $7 in your pocket if you're on your way to Costco anyways. Similar to Gigwalk, the closer you live to a metropolitan area, the more jobs will be available to you via the app. How do you use your smartphone to earn a little extra money? Loaded the Receipt Hog app on my phone yesterday. Couldn't sign up, I keep getting an error message, although one time when I was trying to sign up with Facebook I did get a message telling me they had enough members and I would need to wait for an invitation. Oh well. Ebates is another option if you order a lot of things online.